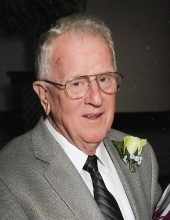 Ronald Lee Canterbury, age 83 of Wellsville passed away September 24, 2018 at the Olathe Hospice House. Cremation. Memorial services will be 11AM, Saturday, October 20, 2018 at Wilson's Funeral Home in Wellsville. Visitation will be 10-11AM, one hour prior to services. Memorial contributions may be made to St. Jude's Children's Research Hospital in care of Wilson's, PO Box 486, Wellsville, KS 66092. Ronald Lee Canterbury was born December 5, 1934 in Kansas City, Kansas, the son of Virgil Bradley and Olga D. (Ozbolt) Canterbury. He grew up in KCK and graduated from Wyandotte High School in 1952. On April 14, 1956, he married Joan Marie Manczuk at St. Joseph's Catholic Church in KCK. Ron moved to Wellsville in 1965 where he and his wife raised their family on their farm. They were married 62 years before his passing. Joan survives at the home. Ron worked as a supervisor for Deluxe Check Printers for 31 years, retiring in 1983. He also was a school bus driver for USD 289 for many years. Ron loved to raise horses and was a member of the American Saddle Horse Association. He loved farming and loved his family and grandchildren. Ron is survived by his wife of the home; daughter, Diana (Dennis) Macksey of Canton, GA; son, Jeffery L. (Tamara) Canterbury of Baldwin City, KS; son, Christopher B. (Carlene) Canterbury of Wellsville; daughter, Kimberly A. (Kevin) Beasing of Lee's Summit, MO; son, Andrew A. (Laura) Canterbury of Edmonton, Canada; sister, Sharon K. McCrackin of Blountville, TN; brother, Richard Canterbury of Rock Springs, WY; 12 grandchildren; 12 great- grandchildren; and many nieces and nephews. He is preceded in death by his parents and a granddaughter, Shannon Marie Lawrence (2011). To send flowers or a remembrance gift to the family of Ronald Lee Canterbury, please visit our Tribute Store. "Email Address" would like to share the life celebration of Ronald Lee Canterbury. Click on the "link" to go to share a favorite memory or leave a condolence message for the family.